Welcome to Globalization ICAS monthly theme exhibition – NEWWORKS, we are proud to showcase some of finest ART works completed by our members for their entry to our Eighth exhibition . 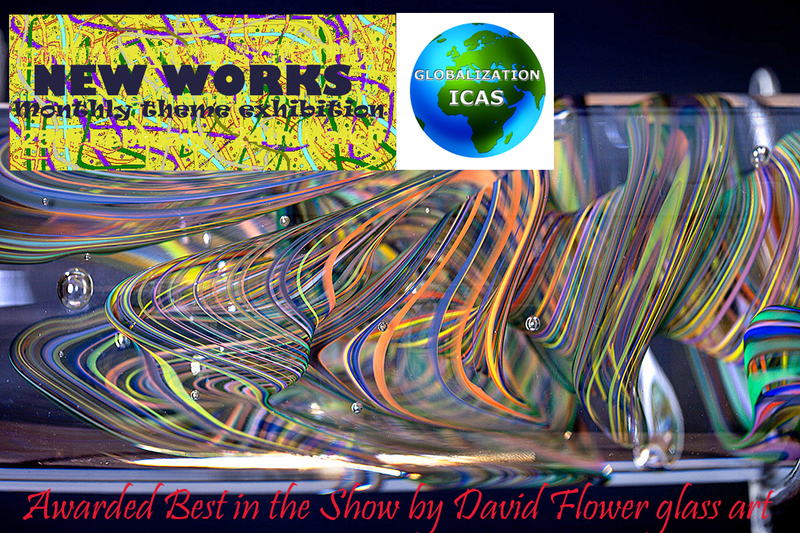 It give me great pleasure to confirm our awards for excellence to present to both DAVID FLOWER for his accomplishment of working with the medium of blown glass producing exquisite works here capturing the four seasons as individual pieces, producing a vibrant Kinetic glass art sculpture using variety of medium from twisted steel metal, glass and wood completing his four piece insulation. We look forward to seeing more works from him in our future exhibitions. The second award to VERED TERRY for her atmospheric landscape paintings once again showing total control of her technique, style and love for precious landscapes were she escapes to places of her dreams, peaceful,tranquil and areas untouched by civilisation all captured on her finish canvases.., We constantly find her work regularly selected for awards and continues to deliver amazing results winning our imagination.., I am very pleased for you as you deserve the recognition. Thank you to this month’s panel of jurors – Laara, Carole, Pauline, Renee, Ranjan Ted and Peter for completing an excellent job, we had submission of work from around the globe totalling of 30 entries. The awards to select the best in each category are beginning to get closer therefore it would useful for every member entering our monthly theme exhibitions to note the following for our future exhibition. Congratulations to the winners and to all! Fresh off the press of Sunil’s announcement of the August themed exhibition winners, I just wanted to let all of you that while it is customary for jurors not to give feedback, since we do leave comments on work online for each exhibition, I am happy to discuss my critiques with artists should they wish to discuss it with me. I have not had much time recently to be present here and while I try my best to keep up with discussions as time allows, I do want to congratulate all participants in recent months. It has been and remains a great opportunity for me to see and engage with new and established artists from among whom, I have seen some of the finest work in some time. My thanks to Sunil and Peter for the invitation and the opportunity. I look forward to meeting you each here in time. Good morning to you all hope you’re all having a fine exciting day. It’s been mild here in the UK with some sunny patches here and there otherwise settling down to Wintery condition. Renee thank you for your on-going support and now become our regularly feature to join our panel of International jurors. Your critical comments and observation has being a treat for both the members participating and to members observing the development of our monthly exhibitions. For all the members waiting to join I would highly recommend that you make efforts to join the rest of us. Ciao Renéè, grazie per la possibilità che mi dai di scrivere in italiano, ma forse perchè non hai capito il commento precedente? Ho capito benissimo ma pensavo per te un opportunità per esprimersi senza limite . . .
Renée ho detto non hai capito in cosiderazione che mi aiuto con il traduttore e certe volte i concetti vengono stravolti. L’idea di potere scivere in Italiano mi alletta, ma non vorrei che diventi un dialogo a due, escludendo tutti gli amici di ICAS. Per evitare questo, dialogherò con te in italiano, di questo ti ringrazio, poi tradurrò lo stesso commento per tutti, cosa ne pensi ? Renee i said you haven’t understood in acknowledge that i help with the translator and sometimes concepts are disrupted. The idea of power writing in Italian i broomstick, but I would not like to become a two-way dialog, excluding all friends of ICAS. To avoid this, dialogue her with you in italian, of this I thank you, then tradurro the same comment for all, what do you think ? Congratulations to all of the extraordinary artists who participated in the ICAS “New Works Project”. Beautiful and inspirational.